Nikon Coolpix S9 compact digital camera features 6.0 megapixels CCD sensor which able to develop prints as large as 16 x 20 inches, 3x optical Zoom-Nikkor ED Glass lens, 2.5-inch color LCD which offers 170-degree wide-angle of view, One-Touch Portrait Button which automatically activates In-Camera Red-Eye Fix and Face-Priority AF, USB and Pictbridge compatible. Nikon S9 also has Nikon In-Camera Innovations which features In-Camera Red-Eye Fix that fixes most instances of red-eye, Face-Priority AF that uses Nikon’s face-finding technology that automatically focuses on faces, and D-Lighting rescues dark or backlit images by improving brightness and detail where needed. At the full review for Nikon S9, DigitalCameraReview concludes that the camera is nice and compact – definitely small enough to slip into a pocket or purse. It operates quickly and takes good shots. The S9 is also one of the cheaper, high quality ultra-compact cameras that you’ll find. Unfortunately, with the money that you save, I would recommend that you get a spare battery since the battery life of the camera is not amazing. The camera is definitely not meant for an advanced shooter, or someone who wants to tweak settings until they get just the right shot as there are no manual exposure controls. However, I would still recommend the S9 for someone looking for an ultra-compact camera with some style and an affordable price. 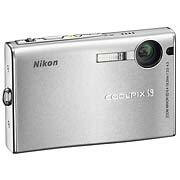 For more features, specifications and sample images, visit Nikon Coolpix S9 official homepage (no longer available).